A Taste of Jesus is an in-depth look at the characteristics that are meant to make up the Christian's life: love, joy, peace, patience, kindness, goodness, faithfulness, gentleness, and self-control. Bradley explains just how radical and counter-cultural these fruits are when they are grown in fullness. These are the characteristics of the upside-down, backwards Kingdom of Heaven and when we live like we're residents there, we begin to give people a real taste of Jesus, who is living inside of us via the Holy Spirit. 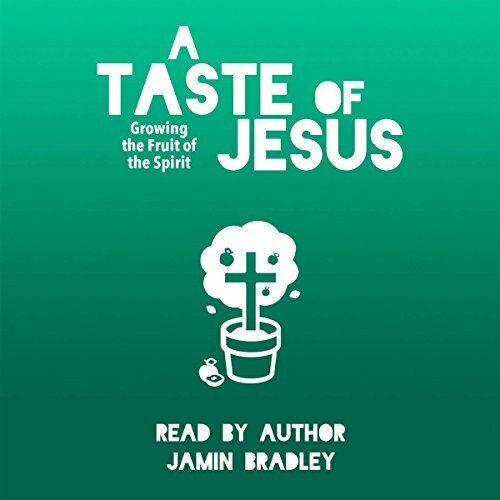 This is by no means meant to be an easy audiobook to absorb, for the fruit of the spirit constantly butts heads with our flesh - but if you feel uncomfortable, maybe that's okay. Embrace it and see what God does. In some ways, the original book was built to be an audiobook. Background sounds illuminate the opening story. Intermissions break up the chapters fluidly. You can actually hear the original music at the end of the audiobook rather than just listen to the lyrics. And on top of this, A Taste of Jesus is brought to you by an avid audiobook listener, and experienced audiobook narrator. Jamin Bradley is ordained in the Free Methodist Church and is the lead pastor of 1208 Greenwood in downtown Jackson, MI. He and his wife Jodi have two energetic kids named Beckett and Jericho, who love to keep them on their toes. Outside of pastoring and writing, Jamin loves video games, board games, grilling, entertaining guests, writing, recording, and playing music. Jamin Bradley delivers content in this book that is full of beautifully constructed reminders and stories that teach the reader. Each topic is thought-provoking, real, relevant, and needed. I, especially, found the chapter on joy convicting. "If we want to find joy, we need to simply turn our attention to God and embrace the happiness we find there." Thank you, Jamin, for a great read!